IS THERE A ROLE FOR CABLE EXTRACTION ON LOW GRADIENT SENSITIVE SITES? This paper discusses the challenges to extraction of wood on low gradient harvesting sites that are classified as “sensitive” and therefore have limitations on the use of forwarders and skidders for ground based wood extraction. 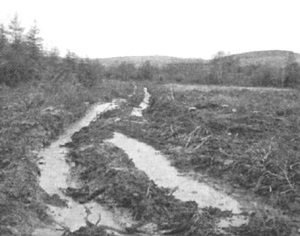 Although the discussion is centred on plantation forests on peat soils in Ireland, the same may be generalized for forests on other soft soils that restrict the environgentle use of forwarders and skidders. Wood extraction by cable systems is important for sustainable harvesting operations on such sites. Ireland's forest area comprises approximately 9 percent (626 000 ha) of the total land area (Forest Service, 2000). The Irish Forestry Board (Coillte) manages 70 percent (450 000 ha) of the forest area, of which about 80 percent is under commercial timber crop. The main commercial tree species include Sitka spruce, Lodgepole pine, Norway Spruce, Larch, Scots pine and Douglas fir, and these are established on five major soil categories, with 44 percent on peat soils (see Figure 1). 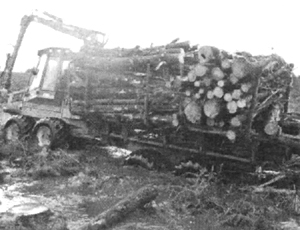 Cut-to-length (CTL) forest harvesting technique is predominantly used in wood harvesting, and involves the use of CTL harvesters, and chainsaw felling and bucking (motor-manual tree harvesting), with both employing various configurations of purpose built forwarders and tractor trailer systems for moving timber within the forest. This paper gives an overview of the challenges encountered in the use of forwarders for wood extraction on forest sites that are located on soft soils. It is an initiative for assessment of the feasibility of cable systems, and for collation of technical information and experiences with new trends in wood harvesting with cable systems that could be adopted for extraction on soft peat soils in Ireland and elsewhere. Terrain classification is based on three factors, namely (see Table 1): the ground condition (principally soil bearing capacity); ground roughness (includes obstacles such as boulders and trenches); and ground slope. 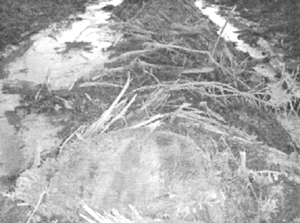 Wood extraction operations that are best suited to a harvesting site are broadly assigned and based on this classification (see Table 2) in order to minimize damage to the sites (and the residual stands in case of thinning), including safety consideration for harvesting machines and operators. Integration of machine suitability to respective harvesting site conditions is crucial when dealing with “sensitive sites”. A sensitive forest site is where alterations to the normal mechanized harvesting practices are required in order to avoid adverse effects on ecological, economic and social functions of the forest and its surroundings (ECOWOOD, 2001). Table 2 suggests that ground roughness and slopes are the dominant criteria for decision on employment of cable systems for wood extraction. For example, terrain classes 4.1.1 and 4.2.1 are in the worst ground condition, i.e. very poor, they are suggested as suitable for wood extraction by tracked forwarders. Classes 4.1.2, 4.2.2 and 4.3.1 suggest the potential use of both forwarders and cable systems. 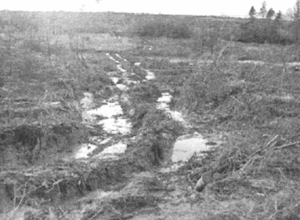 Peatlands and other wood harvesting sites with soft soils present unique challenges to flotation and mobility of the CTL harvesters and forwarders, hence, the efficiency in their use. 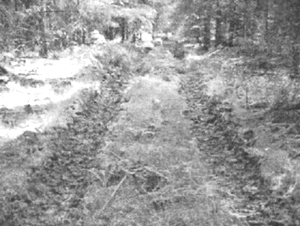 Wood harvesting in deep peat conditions is commonly clear-felling, and quite often premature felling, i.e. 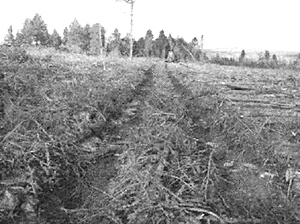 harvesting of forest before the normal age and tree size is reached in order to forestall losses and costly salvage harvesting of wind-felled trees (Buswell, 1992). Currently the approach applied to the harvesting of such sites in Ireland is to lay a brashmat ahead of harvesting machinery traffic. 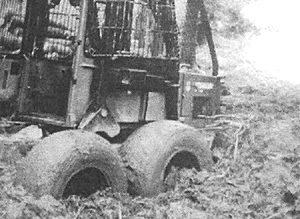 However, machine mobility is still a major constraint and CTL harvester and forwarders must be fitted with wide tyres, dual wheels, and band-tracks or specially adapted moccasins (Daly, 1998) to complement the use of a brashmat in order to avoid excessive machine sinkage (see Photo-Series 1). Reducing the payload on forwarders, with a multiple load-handling regime may also be considered. 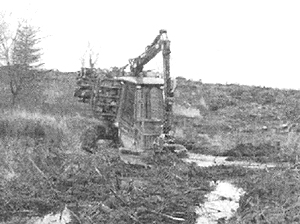 Excessive machine sinkage has direct bearing to the cost of machine operations, and may lead to excessive site disturbance and soil damage (see Photo-Series 2). The latter may have significant effects on soil structure and runoff characteristics, with potential negative affects on the yield of the residual stands for thinning operations, and increased potential soil erodiblity (see Photo-Series 3). For these reasons, the harvesting areas on peat soils may be classified as “sensitive”. Tree roots are known to stabilize soil and enhance the load bearing capacity and shear resistance of the forest floor. 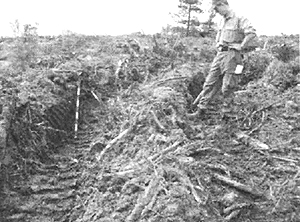 Wästerland (1989) estimated the incremental soil-reinforcement resulted from the presence of tree roots to be in the range of 50 to 70 percent. 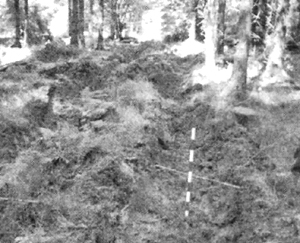 In areas with peat soils, this reinforcement factor (from the inherent vegetation layer as well as tree roots) is the determinant of mobility of the forestry machines, as the soils deform easily to develop deep ruts with poor support for machine traction. It also determines the potential damage to the residual stands, during the primary and/or subsequent thinning operations, and may dictate the need for alternative wood extraction systems such as the cable. Machine mobility on forest sites with soft soils may be a limiting factor when tree growth in such areas has low yield of branches (e.g. 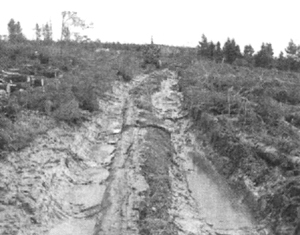 in prematurely felled areas) that could be used as brashmat to enhance trafficability during timber harvesting and forwarding (Daly, 1989). The soil reinforcement by root networks may therefore influence the selection and operation of mechanical harvesting and extraction systems for ecoefficient wood harvesting of such sensitive sites. However, soil reinforcement by root networks diminishes with increasing number of vehicle passes (Cofie et al., 2000). 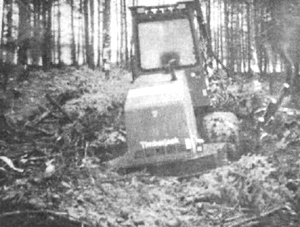 In deep peat and other soft soils where this reinforcement is the only supporting medium, the brashmat on the extraction racks may degrade rapidly with machine successive passes to stall the timber extraction process altogether (see Photo-Series 2). The trend in wood harvesting on sensitive sites is towards full mechanization of the harvesting process because of the reducing number of chainsaw operators, and such sensitive sites are getting exposed to increasing machinery traffic. However, because of the growing environmental concerns, there is need to reassess the site suitability (technical and economic) of cable extraction systems as a means of minimizing soil disturbance which may generate secondary environmental concerns i.e. 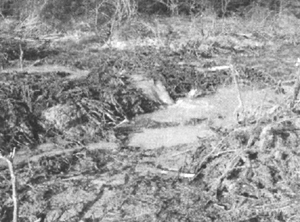 soil compaction and erosion. Cable extraction system is less sensitive to ground condition and weather related machine productivity impedance factors that are depicted in Photo-Series 1 through Photo-Series 3. Because of its minimal requirement for extraction tracks and less roading on steep hillsides, negative impacts to soils and water catchments, and the visual impacts on sensitive sites are less. 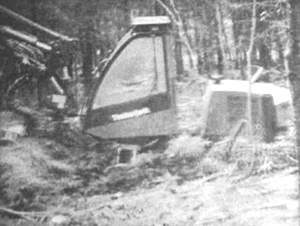 Cable extraction (see Photo 1) is different from other ground based wood extraction systems (forwarders and skidders) in that soil-machine interaction is minimal or eliminated altogether. Movement of the base winching machine is confined to translocation between adjacent landing areas and harvesting sites. During operation, the winching machine is fixed; hence, the system can be used in steep terrain and on wet soil sites. If the cable system permits full suspension of the load (skyline), the soil disturbance associated with wood extraction is eliminated. Table 3 presents the age profile of cable systems that have been used in Ireland in the period 1970–1997. 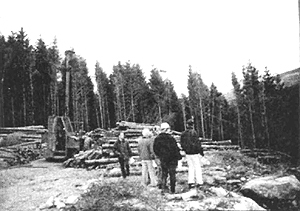 The systems had a combined capacity of about 120 000 m3, which was about 5 percent of the annual wood production (Forest Service, 1997). Currently the number has reduced to about 6 units because of shortage of labour and unfavourable economics (Lyons, 2001), but the increasing need for compatibility of wood extraction methods with harvesting site conditions favours the increased use of cable systems. Cable systems can be employed for CTL, full pole/full tree extraction, and in both thinning and clearfell operations. The cable systems in Ireland have predominantly been used for thinning, and a typical whole tree system requires a crew of 1 skyline operator, 2 chainsaw operators, 1 chockerman, and 1 forwarder/processor operator. 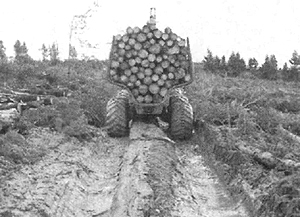 For the trailer mounted and tractor powered “Timbermaster”, maximum yarding distance is limited to 500 m. “Payout” carriages allow for wood extraction from positions adjacent to the skyline corridors. Production rate is about 3 m3 per hour (based on 40 productive man-hours per week). The use of a mobile plant to anchor the systems can reduce the set-up/movement time by up to 20 percent. Greater use of cable extraction for clear-felling operations would require a change from the current systems to larger units. Cable systems in general are substantially more expensive to operate than other extraction systems, such as forwarding and skidding (see Table 4). It requires a high degree of organization, is labour intensive, and requires highly skilled operation and effective teamwork (Forest Service, 2000). The key concerns for economic operation on low gradient sensitive sites include: i) economic yarding distance; ii) size of payload per cycle; iii) expected/tolerable deflection and sag in the main skyline (may further constrain the payload limits for sites with low gradient), including the type of rigging configuration; and iv) planned harvesting area or volume for extraction for each set-up. Difficulty in engaging and retaining suitably trained staff. There is an increasing demand for environgentle extraction of wood on sensitive forest sites in order to minimize soil compaction and damage to the roots of residual stands, and soil erosion and siltation of watercourses adjacent to the harvesting sites. The cable system offers possible methods for such limitation, but is currently underutilized because of the low production rates, excessive set-up times, scarcity of labour for harvesting with chainsaws and on steep slopes and difficulties in obtaining adequate insurance cover. Compilation and presentation of this paper was supported by the ECOWOOD Project (URL: www.ucd.ie/~foresteng), which is funded by the European Commission under the Fifth Framework Programme (FP5) on Quality of Life and Management of Living Resources. Buswell, K. 1992. Developments in harvesting on soft ground. Agricultural Engineering Incorporating Soil and Water. Autumn, 1992, p. 93–96. Cofie, P., Koolen, A.J. & Perdok, U.D. 2000. Measurement of stress-strain relationships for beech roots and calculation of the reinforcement effects of tree roots in soil-wheel systems. Soil and Tillage Research 57(1–2): 1–12. Daly, E. 1998. Moccasins: walk on water. Forest Machinery Journal 5(3): 18–19. ECOWOOD. 2001. The development of a protocol for ecoefficient wood harvesting on sensitive sites (ECOWOOD). EU fifth framework project on quality of life and management of living resources. Forest Engineering Unit, University College. Dublin, Ireland. Forest Service. 1997. Current and future needs for mechanized wood harvesting in Ireland. Study commissioned by the Forest Service in the Department of the Marine and Natural Resources. Dublin, Ireland. 19 pp. Forest Service. 2000. Code of best forest practice - Ireland. Forest Service in the Department of the Marine and Natural Resources. Dublin, Ireland. IFCA. 2000. Harvesting and extraction prices per tonne based on Coillte's 1995 rates updated using consumer price index. Irish Forestry Contractors Association (IFCA). Ennis, Ireland. Lyons, J. 2001. Personal communication. Wasterland, I. 1989. 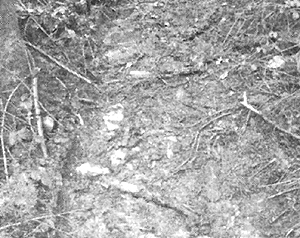 Strength components in the forest floor restricting maximum tolerable machine forces. Journal of Terramechanics 26(2): 177–182.